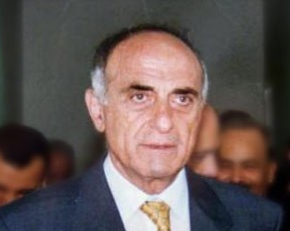 Munib al-Masri is a noted philanthropist, currently being mentioned as a candidate for Prime Minister of a Palestinian Authority unity government. The idea was first raised by Egypt, and has received the blessing of Jordan, the Europeans, and the United States. He is widely considered the one man capable of saving the Palestinians from economic collapse. While he is participating in negotiations between Mahmoud Abbas and Hamas, in interviews he is careful not to make political statements, and he refuses to discuss the possibility that he will become prime minister. He has been quoted as saying, “Here, on my own territory, I’m planning to establish a peace center,” he says. “I want to bring in experts from all over the world to help out in all realms of life to expedite the establishment of an independent Palestinian state. I will build guest rooms here for the guests to stay in, and also a library, offices, appropriate communications arrangements, computers. From here, from this house, the message of development, progress, freedom, and democracy for the Palestinian people will go forth. He is the largest employer in the territories after the government. He was a founder of Padico, the Palestinian Development and Investment Company, and of Paltel, the Palestine Telecommunications Corporation. In the mid-1990s he also established a Palestinian stock market in Nablus to bring in money from private investors for Palestinian companies and to increase employment. Munib al-Masri is renowned for his generosity in the areas of social welfare and education. He contributes to Palestinians in Jordan and Lebanon. A long-time friend and associate of Palestinian leader Yasser Arafat, al-Masri stayed with Arafat in his last days at the Mukata when the building was under siege. He was also with Arafat on the French plane that flew him to the hospital in Paris, and stayed at the leader’s side during the last days of his life. In 1970, at King Hussein’s request, he served in the Jordanian government as Minister of Public Works. For a year and a half he was involved in fixing infrastructure that had been destroyed in the war between Jordan and the Palestinians, and in building road and water infrastructures throughout Jordan.